I lived in Mexico a few years ago during President Felipe Calderon’s “War on Drugs.” I suffered the mourning of a young friend who was kidnapped, tortured, shot, and left dead in a vacant field in his home city of Monterrey. Israel was a bright and handsome college student. The mistake that cost him his life was to meet the wrong person at a party: She was the estranged wife of a drug cartel leader in Monterrey, but she didn’t tell Israel. Their flirtation put an end to his life and the dreams for him of all who loved him. I was aware of the violence in Mexico when I arrived and tried to stay alert. After I came to make friends and saw that they courageously lived their lives in a world abundant with daily horrors and impunity, I realized how safely we lead lives in the United States. I learned that we know so little about how we contribute to problems in the country to the south of us. Israel’s murder began to haunt me a little more each day. I couldn’t forget him. I spent two years researching and understanding the violence of organized crime, especially that of the drug cartels throughout Latin America and the United States. I found out that on the demand side, the people in the United States purchase the majority of drugs coming from the Mexican cartels. On the supply side, our country is the biggest supplier of illegal weapons used by these cartels. These weapons have been responsible for at least 100,000 deaths in Mexico in the past seven years. Even the casual marijuana enjoyed in social gatherings in our country arrives to us with a lot of blood on its leaves. We don’t think about that at all. I do now. I think about my friend, Israel, and how he must have known when his murderers had him that no hero was going to show up to save him. So I have some things to say about international relations between Mexico and the United States, but I say them through personal stories of heroic people on both sides of the border. I know that for people to engage enough to listen to me, they are going to need to relate to the characters I put before them. All the fictionalized people in my novels are based to varying degrees on real counterparts, or they are composites of people whom I knew or heard about. The incredible things that happen in the novels largely come from the news stories of Mexico and the United States. Do I need to say the cliché? Truth really is stranger than fiction. The result of my time in Mexico was the writing of the novel, The Z Redemption. 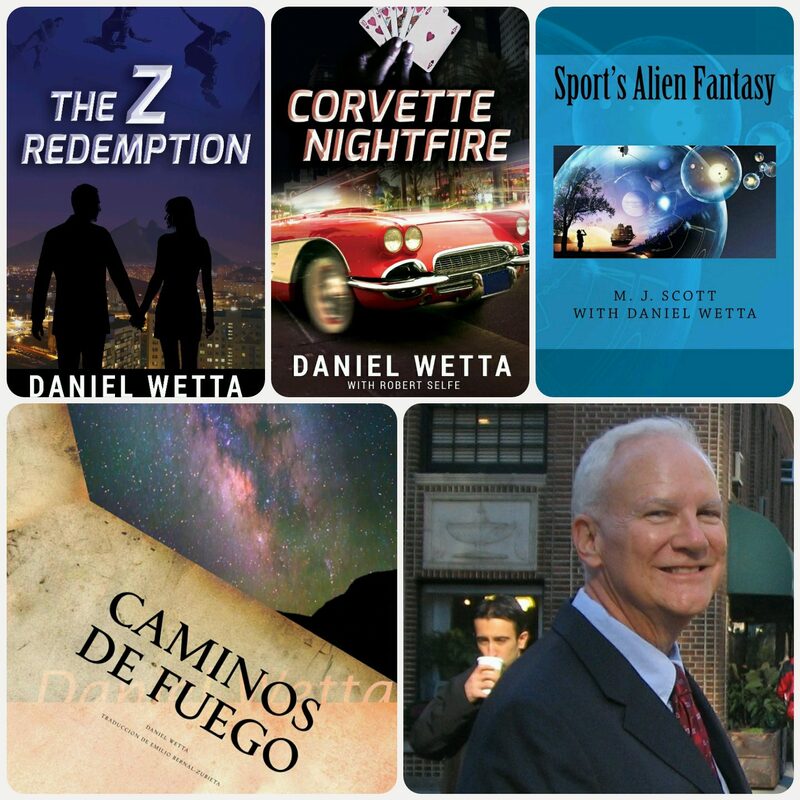 Its sequel, Corvette Nightfire, was published in April, 2014. Updated second editions of both novels came out in 2015. The third volume of the trilogy, tentatively titled El Camino Oscuro, is being co-written with Robert Selfe and should be published within the next year. There are two free short stories related to The Z Redemption novels. The first, “Awakening from the Golden Sleep,” describes early adventures of Ana Valdez when she was a child in Mazatlán, Mexico, a resort city on the Pacific Ocean. In The Z Redemption, Ana is a main character who ends up being President of Mexico after a military coup overthrows the government. The second short story (of which I am especially proud) is a “prequel” to Corvette Nightfire. It is called “Nightfire!” It tells a fascinating story of Corvette Nightfire’s grandparents, Tarahumara Indians who became entangled with the Mexican drug cartel of Sinaloa. Their actions set up Corvette’s destiny, thrillingly depicted with tremendous suspense in the second novel. While working on the third novel with Robert Selfe, I plan also to write a short story related to it. As for my bio, I am a retired Certified Public Accountant who spent most of my career in the health care field. For twenty years I was the CFO and then CEO of a Virginia hospital and nursing home in a large healthcare company. I wrote short stories as a young man, and at the College of William and Mary I really learned to write. I received my undergraduate degree in History there. Later I went to graduate school at Virginia Commonwealth University, where I got a post-baccalaureate certificate in accounting and then my Masters in Business Administration from the University of Dallas. I am a life-long lover of Corvettes, Las Vegas, and living on the edge. I am in love with my family, and I am passionate about United States and Mexican history, the Spanish language, and using social media. A Story in Six Days, a Prize on the Seventh!